The competition is simple. The winner of the previous month picks a theme, then each member of the group picks a mini that fits the theme and paints it. At the end of the month, Vidpui puts all the pics up and everyone votes for their top 3. For this one, it was "Leader of the Pack" and I chose to use one of the Black Diamond Corps for my mini. 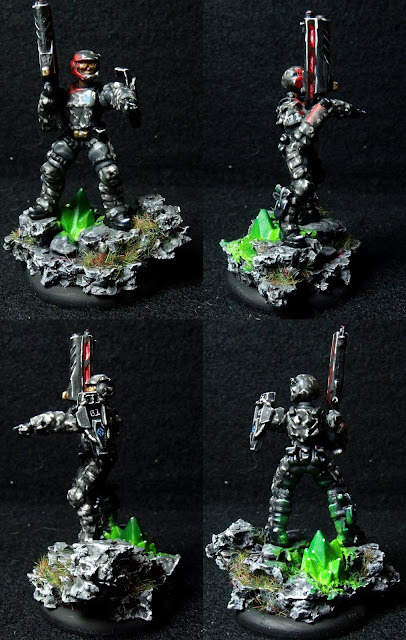 I then painted him up with camo and did a little scenic base. I also tried my hand at some OSL on his gun and off of the crystal behind him and ended up with some decent results. I ended up getting a vote, but got blown out of the water this round. But I think these comps will help push me to become a better display piece painter in the long run. I'm interested to see what the future brings.